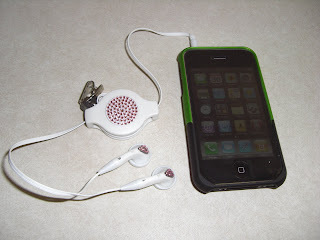 I recently has the opportunity to review a pair of chicBuds earphones in white/watermelon . 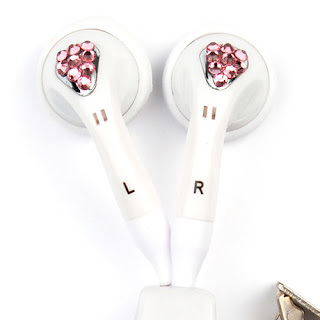 The first thing that catches your eye when you see these earphone are the beautiful swarovski crystals. The built-in retractor is great it allows the cord to expand and retract to 5 stopping points for various lengths so i t will always be comfortable and no cords in the way ! The clip stops cords from bouncing around and the retractable device prevents tangling , which is great because I keep mine in my purse or diaper bag when it is not in use ! chicBuds are avaible in 5 great colors : Blueberry, Grape, Watermelon, Sour Apple and Marshmallow ! I use my chicBuds almost every day and have had many people ask where I got them and that they thought they were so cute. When I use them they make this Mom feel very hip and stylish ! 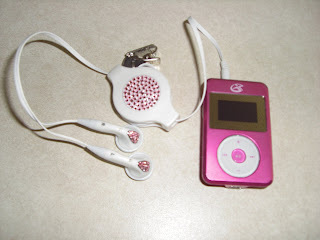 I use them with my iPhone and Mp3 player and they have always work just the way they were intended to. 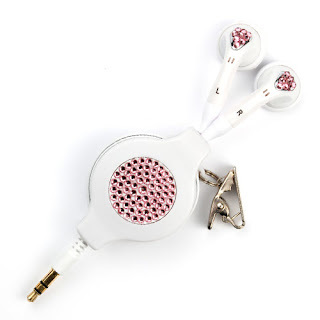 When looking at the chicBuds site another item that caught my eye was their limited edition Breast Cancer chicBuds earphones. Being from a family that has been touched personlly with Breast Cancer I love to see when a company gives their support ! With ever purchase of this limited edition chicBud 10% of the sale is donated to the Susan Komen Foundation. 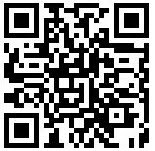 BUY: Visit HERE, I am sure you will find a pair of chicBuds for everyone in your family ! Tons of great styles and colors ! These are super cute! I need some new "buds". And I definitely want something girly! My 13 year old granddaughter would love these!